A camel blazer is an essential piece to any wardrobe. Not only is it a staple for the workplace, but it can easily be dressed up or down for running quick errands around town or for dinner and drinks with friends after-hours. It can really pull together and polish even the most seemingly-boring or basic outfit. A high-quality, well-fitting blazer is definitely an investment, I know, but the great news is that it will pay for itself many times over with its frequency of wear (cost per wear.) Dressed up or dressed down, it will see a ton of use, giving you the most "bang for your buck" because it will remain a classic and versatile piece that stands the test of time while trends and fast-fashion items will come and go. This classic camel blazer from Banana Republic has served me well over the years -- through countless meetings, luncheons, semi-casual dinner events and more -- and it's still going strong! I managed to score it on sale, and I like that it is fully-lined and has a wool/spandex fabric blend, which gives it a hint of stretch for a more contouring, flattering fit. It's also more of a cropped length, which I prefer on my petite, 5'2" frame, since the length hits above the hips and doesn't chop off the leg line, making me look taller and leaner. This blazer also has the cutest, rounded pockets with inverted-pleat detailing on the front, which I don't see very often. And along the back, it has a nice, buttoned belt, similar to what you might find on a more dressy vest or winter coat. These special details, along with the cropped fit, help to give the blazer a more feminine look and silhouette, which I love. 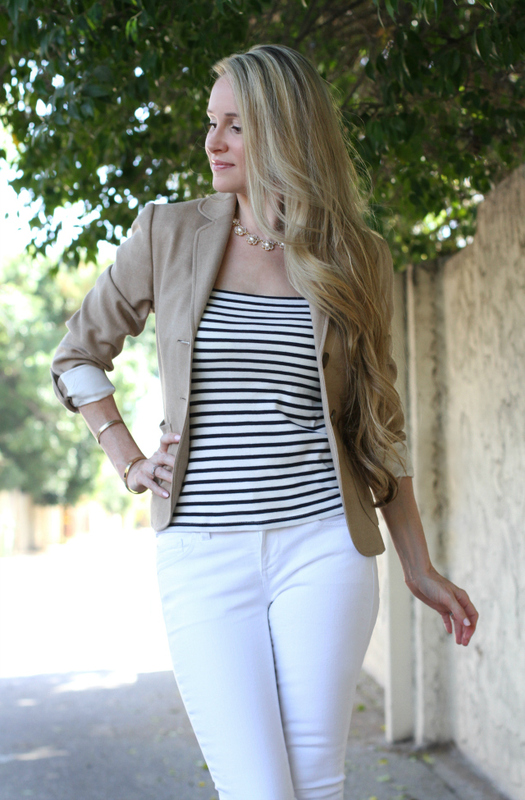 For a semi-casual look, I paired this blazer with my current favorite white skinny jeans from Ann Taylor. These are the modern skinny ankle jeans, which have a more tapered fit at the ankle and are the most flattering, in my opinion. I've said it before, but Ann Taylor is one of my favorite stores -- not only for their great selection of classic, feminine styles -- but for their multiple sizing options. These jeans, for example, are offered in regular, petite, and tall sizes, which is, in a word: awesome! When I'm aiming for a more dressy look with jeans, I don't want to cuff the ankles; I want a clean leg line, especially with pumps. These do the trick perfectly in the petite sizing, which have a 26" inseam, and don't require any cuffing - woohoo! I highly recommend these jeans if you're searching for a flattering pair of white jeans that aren't see-through. They also come in a curvy version here. These jeans are currently an additional 40% off with code "ANN40"! Even though Fall has officially arrived, L.A. is still battling a heat wave, so I've been forced to wear more lightweight layers. For this look, I chose a cotton top in classic navy stripes to layer under the blazer; the navy and camel colors compliment each other nicely, and the top is also practical in that it's cool and breathable. A navy-striped top is also a must-have in any wardrobe! I'm admittedly a bit of striped-top hoarder, but I'm telling you: each top serves its own purpose and sees its fair share of use -- with skirts, jeans, layered under dresses -- you name it, I've tried it. And if it works, why reinvent the wheel, right? If you're looking for a couple of cute options, try here and here! I finished the look with more of my favorite classics: brown, leather accessories. These Ann Taylor heels are the perfect neutral (especially for Fall!) and have the most comfy, padded insoles. They're from last season, but this season's version in patent leather is very similar and looks like a great alternative. More options worth trying are here, here, here, and here. For a matching handbag, I recommend similar Tory Burch bags in the "Tiger's Eye" color here, here, here, and here. These versatile bags are also investment pieces, but they are very high-quality and will last years with proper care! Last but not least, I chose my Kate Spade floral pearl necklace to complete the look. The gold collar design is beautiful and timeless, and the pearl-centered flowers add a playful twist to a standard pearl necklace. If you're looking to add a pearl collar necklace to your collection, I found a pretty alternative for you here. I hope you enjoyed this classic camel look! As always, thanks for stopping by, and I hope you have a wonderful evening!